A pedestrian was killed in central London when branches torn from a tree by a passing bus landed on top of her. Eighteen other people were injured, four of them seriously, when the accident happened in Tower Bridge Road at about 0945 BST on Tuesday. 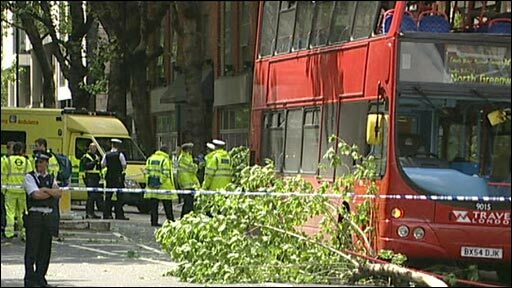 The number 188 bus, which runs between Russell Square and North Greenwich, hit the tree near the junction with Tanner Street in Bermondsey. Police said officers were speaking to the driver of the bus. A spokesman for the London Ambulance Service said its crews treated 18 people. Nine people were taken to hospital, four of whom had suffered serious head and neck injuries. A Metropolitan Police spokesman said: "One woman was pronounced dead at the scene. "She is believed to have been hit by falling branches." 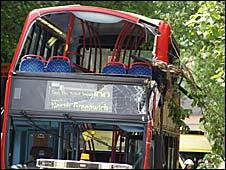 Transport for London (TfL) said it had launched a full investigation into the crash. A spokesman said: "Trees along this section of Tower Bridge Road are owned and maintained by TfL and are included in our rigorous tree maintenance programme." The branch is believed to have hit the right-hand corner of the bus, denting the roof and shattering glass in the front windows of the top and bottom deck. One eyewitness said the collision was caused by a large tree branch which smashed into the double-decker. Builder Tom Riley, 32, said: "I was coming out of the van and heard a crack. "It was as if the tree was just falling and was slowing the bus down. The driver was trying to stop the bus. I do not think the bus driver hit [the tree]." He said that people rushed to help, unaware if anyone was injured. It was only after getting close to the bus that they noticed someone under the tree, who had suffered head injuries, Mr Riley said. Charlie Fayinka, 28, who works nearby, said he saw the bus driver fainting shortly after the crash. "I was outside about a minute after it happened," he said. "People were running out of the bus panicking and I saw a man with an injury to his leg. "There was also an incident where the bus driver fainted. I think it was due to shock." Tower Bridge Road and several other roads were closed, and buses diverted, for most of the day while forensic experts examined the area. The 188 is operated by the Travel London company which operates more than 30 bus routes in the London area. A spokeswoman for National Express, Travel London's parent company, said: "We have people on the scene who are working with the police to try to establish why this accident happened."